Coming and going . . . and my new blog. As longtime readers of this blog may have noticed, frequent moves are a hallmark of the Jesuit novitiate experience. After two years in which I've been frequently on the go, in the next stage of Jesuit formation I expect to be relatively stationary. This week I start First Studies in philosophy and theology at Fordham University, which will be my base for the next three years. Though First Studies does include occasional travel - particularly during the summer, which scholastics typically spend brushing up on languages or doing some kind of apostolic work - for the most part I expect to stay put in New York. I've enjoyed the diverse experiences of the novitiate, but I'm also looking forward to being in one place for a while. Over the past week, I've been completing one final burst of travel before the start of orientation at Fordham. The day after vows, I headed east from Detroit in a rental truck packed with most of my earthly goods as well as those of the other Chicago and Detroit vovendi who'll be studying in the Bronx. I stayed over Monday night at McQuaid Jesuit High School in Rochester, New York, where I was hosted by the Chicago Province's own Father Bernie McAniff. A Rochester native, Bernie provided a fine tour of his hometown. Though I'm rather partial to my own Rochester, I was also very impressed with Bernie's - after all, it's one of the few cities I've visited that has a waterfall downtown. On Tuesday afternoon, I made it to Bronx and dropped off my cargo at Ciszek Hall, the Jesuit scholastic house at Fordham. After a night at Ciszek, I was on the move again on Wednesday as I caught a train to Providence, Rhode Island en route to my family home in Massachusetts. At the end of the week, I spent a couple days at Portsmouth Abbey, where I made a short retreat before entering the Jesuits. Returning to Portsmouth seemed a nice way to bookend my novitiate experience, and I appreciated the opportunity to spend some time in prayerful reflection and to renew my acquaintance with the Benedictine monks who make their home at the abbey. I spent this past weekend at home with the folks. As this home visit winds up, I find myself wishing I had more time here, as always. At the same time, however, I'm grateful for the time I've had. I'm also grateful for the ways in which this blog has enhanced my experience of the novitiate. Originally intended as a means of keeping my family and friend posted on my current activities and whereabouts, Novitiate Notes has also become something of an apostolate for me. Blogging has been rewarding for me on an apostolic as well as a personal level, and I hope to keep it up. As I transition into life as a vowed Jesuit scholastic and as a student of philosophy, I'm starting a new blog, dubbed The City and the World. 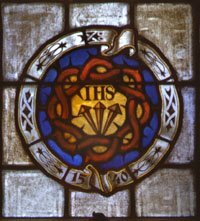 (Please note that the blog's name and its URL are different - as much as I like the name I chose for my new blog, I thought something shorter and snappier - something like "Jesuit Joe" - would make the URL easier to remember.) While I intend to keep Novitiate Notes online, I won't be posting any updates after today. If you want to know what I'm up to now, check out The City and the World. Thank you for being (virtual) companions on my journey through the novitiate, and please know of my prayers and good wishes. AMDG. Almighty and eternal God, I, Joseph Andrew Maximilian Kolbe Isaac Jogues Koczera, understand how unworthy I am in your divine sight. Yet I am strengthened by your infinite compassion and mercy, and I am moved by the desire to serve you. I vow to your divine Majesty, before the most holy Virgin Mary and the entire heavenly court, perpetual chastity, poverty, and obedience in the Society of Jesus. I promise that I will enter this same Society to spend my life in it forever. I understand all these things according to the Constitutions of the Society of Jesus. Therefore, by your boundless goodness and mercy, and through the blood of Jesus Christ, I humbly ask that you judge this total commitment of myself acceptable. And as you have freely given me the desire to make this offering, so also may you give me the abundant grace to fulfill it. At Detroit, Gesu Church, on the 13th day of August, in the year 2006. My final weekend at Loyola House. Returning to Berkley today after a couple weeks away in Chicago, Omena and Clarkston, I received an unwelcome surprise: a summons for jury duty. Don't get my wrong - I regard jury duty as a high civic obligation, and under other circumstances I'd be happy to receive the notice. In this case, however, the Oakland County Jury Clerk asked me to report for duty on the last day of August - at which point I'll be a few days into my first semester of philosophy studies at Fordham. A call to the county courthouse revealed that I would be relieved of my obligation so long as I could provide documentary evidence of my imminent move to New York. Though I had little difficulty gathering the necessary documents, the task took up most of an afternoon that I had hoped would be devoted to packing for next week's move. As a result, I anticipate a busy night of packing and an even busier day tomorrow as my Bronx-bound companions and I begin the task of loading the U-Haul truck that will take our meager temporal goods to New York. Your prayers for this endeavor are earnestly appreciated. Omena was fun. The Traverse City Film Festival is in its second year, and though many of the films I wanted to see were sold out I made it to three showings - I saw A Clockwork Orange and Dr. Strangelove, both offered as part of a Stanley Kubrick retrospective, as well as the acclaimed and controversial Palestinian drama Paradise Now. This past Sunday I and a couple other Jesuits attended Mass at the Carmelite Monastery of the Infant Jesus of Prague in Traverse City, which seems a bit stricter than the two or three other Discalced Carmelite communities I've encountered in the past. Though I expected the cloistered nuns at the monastery to remain in their private oratory during the Mass, I also presumed they'd be visible through the grille at some point during the liturgy - during communion, for example. This was not to be the case; in Traverse City, the Carmelites are heard but apparently never seen. 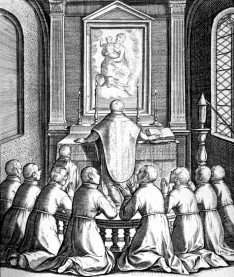 The nuns sang throughout the Mass, but they did so from within an oratory with a window small enough that they could see out but no one else could see in. This presented an interesting contrast with my experiences at Santa Clara - where I was able to enjoy a friendly chat with a couple of the sisters in the sacristy after Mass - and in Cusco, where I briefly glimpsed a Carmelite in full habit opening and closing the monastery door. For what it's worth, I'm glad I had a chance to see something of the Carmelite presence in Northern Michigan, even if I didn't actually see any Carmelites. My retreat at Colombiere was pretty low-key. The focus of the three days was to prepare spiritually for the experience of making first vows this coming Sunday. I suppose I'm as ready as I'm going to be to take vows, though I don't know exactly how I'll feel until I'm actually kneeling on the floor of Gesu Church reading the vow formula that I carefully wrote out by hand last night. As the hours before the ceremony become fewer, I feel a sense of increasing excitement regarding the commitment I'm about to make and the challenges that lie ahead. At the same time, I also feel a bit apprehensive about all the tasks I need to complete over the next few days. Professing perpetual vows of chastity, poverty and obedience is, to put it simply, a big deal. In ways banal and concrete, preparing to move from Detroit to New York is also a big deal, as is the prospect of being a full-time student again after two years out of school. My prayer for the next few days is that God will give me and my brother novices the strength to do all that we must do. More than ever, your prayerful support is needed and appreciated. AMDG. Sorry for the lack of posts this week. Since we got back from Peru, the second-year novices have been very busy packing and planning for our move to First Studies following Vows. (We don't have any more planning to do for the Vow Mass itself - click here to learn more about the arrangements.) Tomorrow we head to Chicago for the priestly ordination of our brother Jesuit Pat McGrath, who will receive the sacrament of Holy Orders from Bishop Carlos Sevilla at an evening liturgy at Old St Patrick's Church in the Loop. On Sunday, we head up to Omena for summer villa ("vacation" for you externs). A few days before Vows, the secundi report to Colombiere for a triduum retreat. I'll post an update when I'm able and as the spirit moves me. Until then, I hope all is well. AMDG. That´s what the Incas called Cusco, the erstwhile imperial capital where I spent most of the past week. I haven't researched the reasons behind the 'navel' designation, but I wonder whether it has something to do with the city's geography. An Andean metropolis that is home to nearly half a million people, Cusco sprawls across a bowl-like valley surrounded by mountains. I suppose that the valley containing Cusco could be seen as a navel in the midst of a very mountainous stomach. Given the important role that Cusco played in the political, religious and social life of the Incas, it may also be surmised that the city was the navel at which everyone in the empire gazed. I hope that any scholars with knowledge of the real meaning of the 'navel' title will forgive my fanciful musings. Cusco is a profoundly Catholic city, filled with Spanish colonial churches, convents and religious monuments. Cusco is a place where one can see nuns in habit walking down the street and boys removing their hats and making the sign of the cross as they pass churches. It's also a place where many restaurants and shops routinely close on Sunday, opting to observe the Sabbath rather than stay open to serve the hordes of tourists who maintain a year-round presence in the city. 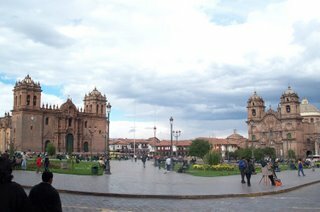 Cusco's Plaza de Armas (pictured above) bears vivid witness to the Church's cultural dominion over the city, as prominent churches front on two sides of the square - the Cathedral (left) and the Iglesia de la Compania de Jesus (right). Considered one of the most architecturally significant Spanish churches in Peru, La Compania is also a fine example of the style of "Jesuit baroque" characteristic of many of the churches established by the pre-Suppression Society. For my part, I have to admit that La Compania is one of the most beautiful churches I've seen in Peru - which is saying a lot, as this country has a lot of lovely old churches. Though La Compania exercises physical dominance over Cusco's central square, other factors suggest that Cusco is much more of a Dominican town than a Jesuit one. The Dominican presence in Cusco began with Friar Vicente de Valverde, who arrived in the city with Francisco Pizarro in 1533 and later became Peru's first Catholic bishop. Following the Spanish conquest, the Dominicans established a church in Cusco on the site of the city's most important Inca temple, Koricancha. This church, Santo Domingo, still exists - in fact, I attended a bilingual Spanish/Quechua Mass there yesterday morning. Much more sensitive to native culture than their 16th-century predecessors, the friars who staff Santo Domingo today not only offer services in the language of the Incas but also operate an excellent museum preserving some of the ruins of Koricancha as well as a fine selection of 17th and 18th-century religious paintings and other artifacts. (For some good pictures of Koricancha and Santo Domingo, click here.) Not to be outdone by the friars, Dominican women also have a notable presence in Cusco. A block away from Cusco's Plaza de Armas one can find the convent of Santa Catalina, a colonial foundation where a group of cloistered Dominican nuns follow a strict routine of common and individual prayer (and bake cookies, which are offered for sale at the entrance to the convent). Around the corner from Santo Domingo, two separate congregations of Dominican sisters (one named for Santa Rosa de Lima, the other for the Immaculate Conception) operate girls' schools - right next door to one another. On the grounds of one of these schools - the Colegio Santa Rosa de Lima - the Dominicans run a hostel, which is where the novices of Loyola House stayed during our time in Cusco. For all the old jokes about animosity between Dominicans and Jesuits, the sisters were very gracious hosts and treated our group very well. In fact, I'd be very happy to stay with them again, and I'd recommend their hostel to others seeking lodging in Cusco. During our time in Cusco, we also made visits to Machu Picchu and various other Inca historical sites in the area known as the Sacred Valley. There's a lot more I could say about this, as well as about my stay in Cusco (for example, there's a great German restaurant there that I visited a couple times). However, I had better stop here as we're leaving for the airport in a few minutes. Once I've gotten back to the States and had an opportunity to get reacclimated, hopefully I'll have a chance to share more about my time in Peru. If I don't have that chance, I hope my readers will be content with the assurance that I had a great month in the country and look forward to spending more time there. AMDG. A French Carmelite restaurant in Lima. Yesterday evening I had dinner with fellow novices Jake Martin, Jim Shea and Chris Staab at L´Eau Vive, a French restaurant in downtown Lima run by Carmelite religious women. I first learned of L´Eau Vive from a travel guide description that I read as I was preparing to leave for Lima. All that The Rough Guide to Peru had to say about L´Eau Vive was that it was a French restaurant operated by nuns who sang the Ave Maria during dinner; I was sufficiently intrigued by this information that I resolved to visit L´Eau Vive during my time in Lima. Now that I´ve been to this unique and delightful restaurant, I´d like to eat there again. L´Eau Vive is an apostolate of the Famille Missionaire Donum Dei, a community of Catholic religious women founded in 1950 by Marcel Roussel, a French diocesan priest deeply influenced by Carmelite spirituality. From the start, Father Roussel´s community focused strongly on evangelization and missionary work. In the early 1960´s, the Donum Dei community began establishing French restaurants named L´Eau Vive in various cities around the world. Father Roussel described the L´Eau Vive restaurants as Carmels ouverts, ¨open Carmels¨ where sisters of the Famille Missionaire Donum Dei would serve the Church´s mission of evangelization through the witness of their lives of prayer and service and through gracious hospitality. At the same time, every meal eaten at L´Eau Vive would help feed the poor; all the proceeds from the restaurants go to support Donum Dei´s mission work. As far as I´m aware, L´Eau Vive is the only international restaurant chain run by a religious community as a charitable venture and as a means of evangelization. Though Donum Dei works on five continents, they are not present in the United States. Certain that I wouldn´t soon have another opportunity to dine at a L´Eau Vive restaurant, I knew I´d have to check the place out before I left Lima. As I expected, dining at L´Eau Vive-Lima was a unique and fascinating experience. Located in an old mansion on a street lined with colonial buildings, L´Eau Vive stands out from its neighbors solely by virtue of a small sign on the door, painted by hand in elegant and unmistakably French cursive. To enter the restaurant, my companions and I had to ring a bell and announce ourselves via intercom. Our charming and gracious hostess, a Donum Dei sister from France, offered us a trilingual greeting (Spanish, French, English) and escorted us to our table in the high-ceilinged but simply-furnished dining room. Our hostess chatted amiably with us in both Spanish and French; pleased to learn that we were members of the Society of Jesus, she spoke of Jesuits she knew in Lima and in Rome and assured us of her prayers for us. Just as we were finishing our meal - the food was excellent, by the way - the eight or so Donum Dei sisters in the Lima community gathered in the dining room to sing a Marian hymn in both French and Spanish. I was touched by the sisters´ singing, which bore witness to their identity as religious and offered a prayerful and reflective end to a fine meal. A unique, enjoyable and ultimately grace-filled experience, my dinner at L´Eau Vive was one of the highlights of the time I´ve spent in Lima. Rounding out this post, I must make note of two significant events that occur on July 16th. One is the Memorial of Our Lady of Mount Carmel, the patronal feast of the Carmelite Order. This year, the Memorial isn´t on the Church´s liturgical calendar because it happens to fall on a Sunday. Nonetheless, it strikes me as rather appropriate that my brother novices and I observed what would otherwise have been the Vigil of the Memorial by having dinner at a restaurant run by Carmelite sisters. Another event that takes place every year on July 16th, Sunday or weekday, is my mother´s birthday. Mom, I´m sorry I´m not there to celebrate your birthday with you, and I hope you´re enjoying the day. Happy birthday! As some readers may have already learned from Richard´s blog, Tomorrow morning my fellow novices and I fly to Cusco, once the capital of the Inca Empire and now a major tourist destination. I doubt I´ll have much access to the Internet while I´m in Cusco, so the next update to this blog will likely come next Sunday when I return to Lima. Until then, I wish all my readers the very best. AMDG. From LarcoMar to Avenida Venezuela. Over the past three weeks, I've heard a number of North American Jesuits who've spent substantial time in Peru comment on how living here has changed the way they look at life in the United States. Though I've only been here a short time, I've sensed subtle changes in my own perceptions as well. Though the differences between life here and at home are more immediately striking, the unexpected similarities are significant as well. In some ways - too few, I'm sure - I feel that being here has given me a little better sense of the problems that Peru and the United States share as well as the unique dilemmas that countries like Peru face in an increasingly interconnected world. This weekend, I made a couple trips in the company of other novices to Miraflores, a posh Lima district about half an hour away by bus from scruffy but decidedly middle-class Breña, the area where we live. A couple of the novices have dubbed Miraflores "the Birmingham of Lima," noting that the Peruvian municipality and the Detroit suburb offer a similar combination of well-tended parks, walkable streets and high-end retail. Of course, the differences between Miraflores and Birmingham are very many - one of the most striking being that Miraflores is perched on a series of bluffs overlooking the Pacific Ocean (which is a lovely sight to behold in spite of the winter fog). Built into one of these bluffs is LarcoMar, an outdoor mall which is billed as "the best center of tourism and entertainment in Peru," which I suppose is true if your idea of tourism is ordering American fast food in Spanish and if your idea of entertainment is watching Cuando un Extraño Llama at a multiplex. I don't mean to sound harsh in my judgment of LarcoMar, as I've enjoyed my two visits to the place. The presence of American icons like Burger King, Dunkin' Donuts, Pizza Hut and Starbucks and the architectural feel of a suburban shopping mall make LarcoMar a soothing remedy to the feelings of culture shock and homesickness that gringos in Lima sometimes face. Though comforting in certain respects, going to LarcoMar can also be somewhat disorienting for an American Jesuit who has had the opportunity to get used to the rhythms of life in a place like Breña. After dinner on weeknights, I often join a group of my fellow novices for a walk down the Avenida de la Republica de Venezuela, a busy commercial street right around the corner from the juniorate. 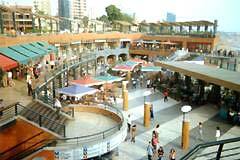 Avenida Venezuela is lined with small stores selling everything from staple food items to paper products to pets. In addition, sidewalk vendors offer a plethora of goods that range from bootleg DVDs to fried chicken to underwear - there's even a man with an old bathroom scale on which passersby can weigh themselves for a small fee. In terms of atmosphere, shopping on Venezuela seems to be almost as far from LarcoMar as one can get while remaining within the realm of commerce. There are things one can buy at LarcoMar that one cannot buy on Venezuela and vice versa. In a nearly absolute sense, the goods for sale on Venezuela are a lot cheaper than those found at LarcoMar (to offer but one example, a single-scoop ice cream cone costs fifty centimos on Venezuela and four soles at LarcoMar, the former being about seventeen cents in U.S. currency and the latter being roughly $1.33). Though the low prices on Venezuela are a bargain by American standards, they can still be a pinch in the pocket for Limeños, even putatively middle-class ones. Experiencing both LarcoMar and Avenida Venezuela in the same day leaves me with a profound sense of ambivalence. On the one hand, I wish that the poor who make up a majority of Lima's population had greater access to the goods and services available to a select few in enclaves like Miraflores. I wish the same were true in metropolitan Detroit, which has more in common with Lima in terms of economic and social inequality than many Michiganders would probably care to admit. At the same time, contrasting my experiences at LarcoMar and on Venezuela also makes me pause to wonder about the negative consequences that greater access to the riches of American commerce and culture could have for people in places like Breña. I fear that a stronger national focus on global economic integration and development of the kind that might improve the material well-being of many Peruvians could come at the loss of particularly distinctive cultural and national identities. Do economic gains outweigh cultural losses? This is a question I often ask myself, a question I've yet to answer. If you think you have an answer, feel free to share it in the comment box. As far as I know, your guess is as good as mine. AMDG. Chicago Province Jesuits in Peru.